Ever since we moved in almost 2 years ago woohoo! we were kinda on the fence about what to do with our dining room area. 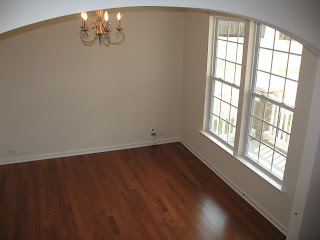 We already have a nice area in between the kitchen and living room with a 6 person table (it can expand to 8 if needed). And how often do most families really use their dining room... a couple times a year maybe. We are all about functional space that gets used so we thought for awhile about having it be a study or an office. By awhile I mean a year and a half while it sat empty with a couple bookshelves in it haha. We finally decided on making it a nice office for Eric. I really liked what was done in this post so that was a little inspiration. The after. I do love the 2 shades of brown/tan separated by the chair rail. We wanted a really nice desk since this is the first room you see when you enter our front door. We were able to reuse the bookshelves to store all of Eric's books and my cookbooks as well as some decor. I hesitated to even post about this since it is not complete but I am hoping to get some ideas. We need something to go on this big wall. It is really the first thing you see when you come in the front door too so I want it to be awesome. We have thought about a collection of maps, collection of photography, 1 big photo... what do you think? I don't want to do plates since I am going to do that somewhere else. What about curtains? Should we do them? If yes, go with white? Or maybe a shade/pattern of blue that ties nicely with the bright green paint in the kitchen? The chandelier. Is it okay or is it too formal and we should do track lighting or something similar like in this post. This is gorgeous. Have you thought about a cornice instead of curtains? I think they are more manly for an office. Take down the chandelier, add a table with a lamp in the space you say you need something, or track ligting with a dimming feature would be nice as well. Keep the chandelier! It is very nice and unexpected and softens up the space. What about a large clock with roman numerals on the wall? And yes, window coverings (something I love but have yet to do in my house) what about a pattern that has a bit of the kiwi green from the kitchen/living room (II know they are two diff shades). Very nice! We also have a dining-room-turned-office in our house, though I've yet to get around to posting about it on my blog. I found you via a blog hop, but can't remember which one, lol, and am now following you. I'm looking forward to looking around your blog! It looks so great! What about getting a painting or several from local artists for the large wall? I love your idea about the maps. What about some maps and a family tree? For the window -- white plantation shutters would look great with the white trim and wood floors. Love the chandelier. Keep it! I love the two tone tan/brown paint...Fill in the wall space with a beautiful, rich looking clock and perhaps move one of those extra chairs to that corner. Also, what brand/colors paint did you use? Thanks, we love it too! The darker color is caramelized onion and the lighter color is hopsack. Both by Valspar.